According to the United States Census Bureau, the county has a total area of 2,962 square miles (7,670 km2), of which 2,950 square miles (7,600 km2) is land and 12 square miles (31 km2) (0.4%) is water. Watercourses in Tehama County include Dye Creek and Payne's Creek. 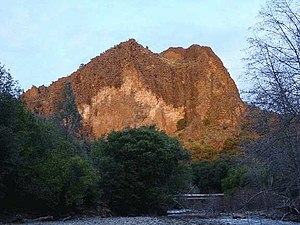 The county is intersected by Sacramento River. 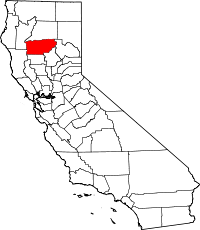 A small part of Lassen Volcanic National Park extends into the northeast corner of the county. The highest point of the county  is Brokeoff Mountain (9,235 feet ). As of the census  of 2000, there were 56,039 people, 21,013 households, and 14,898 families residing in the county. The population density was 19 people per square mile (7/km²). There were 23,547 housing units at an average density of 8 per square mile (3/km²). The racial makeup of the county was 84.8% White, 0.6% Black or African American, 2.1% Native American, 0.8% Asian, 0.1% Pacific Islander, 8.3% from other races, and 3.4% from two or more races. 15.8% of the population were Hispanic or Latino of any race. 14.4% were of German, 11.0% English, 9.6% Irish and 9.5% American ancestry according to the 2000 United States Census. 86.0% spoke English and 13.0% Spanish as their first language. In the California State Legislature, the county is in the 4th Senate District, represented by Republican Jim Nielsen,  and the 3rd Assembly District, represented by Republican James Gallagher.